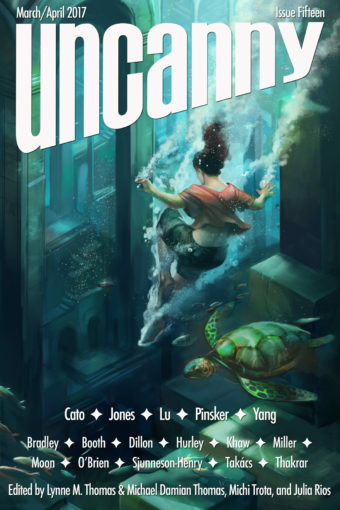 Welcome to Uncanny Magazine Issue Fifteen! All of the content will be available for purchase as an eBook (PDF, EPUB, MOBI) on March 7, 2017. The free online content will be released in 2 stages—half on March 7, and half on April 4. Featuring all-new short fiction by Beth Cato, Stephen Graham Jones, JY Yang, Sarah Pinsker, and S. Qiouyi Lu, reprint fiction by Kameron Hurley, nonfiction by Sam J. Miller, Elsa Sjunneson-Henry, Shveta Thakrar, Dawn Xiana Moon, and Paul Booth, poems by Cassandra Khaw, Brandon O’Brien, Bogi Takács, and Lisa M. Bradley, interviews with Stephen Graham Jones and Sarah Pinsker, and Julie Dillon’s “Submerged City” on the cover. Episode 15A (March 7): Editors’ Introduction, Beth Cato’s “With Cardamom I’ll Bind Their Lips” as read by Erika Ensign, Cassandra Khaw’s “Protestations Against the Idea of Anglicization” as read by Amal El-Mohtar, and Julia Rios interviewing Beth Cato. Episode 15B (April 4): Editors’ Introduction, JY Yang’s “Auspicium Melioris Aevi” as read by Amal El-Mohtar, Lisa M. Bradley’s “The Axolotl Inquest” as read by Erika Ensign, and Julia Rios interviewing JY Yang. Julie Dillon is a Hugo Award-winning artist living in California. 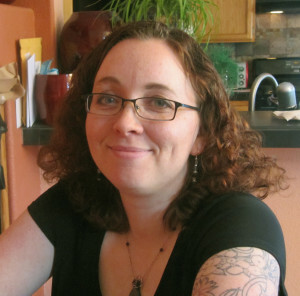 She has had a lifelong love of fantasy and sci-fi art and literature, and is excited to be making her own contribution to the field. Over the years, she has worked on book covers, magazine illustrations, gaming illustrations, and a variety of other commissions, and she is currently working on branching out into creating more of her own work. Her website is www.juliedillonart.com and you can follow her on Twitter at @juliedillon.